Viscometer, Portable and Small Sample | RheoSense Inc.
microVISC™ is the ultimate solution for your routine viscosity measurements. This portable and small sample viscometer is intuitively designed so that users can start operating within one minute. It employs RheoSense's patented Viscometer/Rheometer-on-a-Chip (VROC®) technology and offers accurate and repeatable viscometry measurements, using sample size as little as 100 microliters. 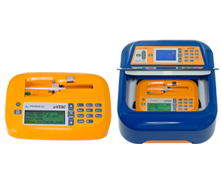 Battery-operated and portable, microVISC™ can be deployed at any laboratory location or in the field. microVISC™ has been adopted by leading companies worldwide as their choice for quick, easy, and rapid viscometric measurements. High precision and accuracy saves time and resources.